GREENBURGH, N.Y. -- Mike Rupp excitedly proclaimed he "survived" the first installment of John Tortorella's dreaded fitness testing. After joking earlier in the week about hoping he doesn't have a heart attack, prized free-agent signee Brad Richards was doing just fine after finishing the grueling sprints. Sure, his heart was racing, but whose wasn't? Everyone were wearing a Rangers practice jersey Friday at the MSG Training Center had sore legs and were struggling to catch their breath. Right wing Marian Gaborik, center Artem Anisimov and defenseman Michael Sauer did not skate Friday as the Rangers went through the first of two days of fitness testing. Gaborik was absent after being in Slovakia on Thursday for the funeral of his good friend and former teammate, Pavol Demitra. Rangers coach John Tortorella said Gaborik was due to arrive Friday afternoon and, "He'll get his test in one way or another." Anisimov was held off the ice as a precaution. Tortorella said there was some concern about the young center's knee after he took his physical Friday morning, so he was going for an MRI. A Rangers spokesperson confirmed to NHL.com shortly before 5 p.m. ET Friday that the MRI was clean and Anisimov is expected to be on the ice Saturday. Sauer didn't skate because he still has some tendinitis in his groin and the area behind his knee, Tortorella said. "We kept him off so hopefully it'll calm down," the coach added. Tortorella doesn't believe Sauer's injury is serious, but he did admit that he is concerned. "Whenever anybody is out and it's been lingering it's a concern," Tortorella said. "We just want to get him skating again. It is a concern because he missed a day." 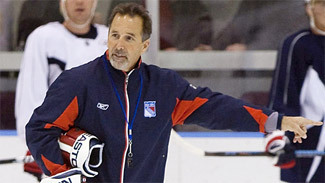 Welcome to the first day of New York Rangers training camp, Tortorella-style. "It feels good right now. It feels good to have it over with," Rupp said not long after his group had finished its on-ice portion of the day. "I heard things about it before I signed a contract in New York. I played with guys who experienced it, and it lived up to expectations. It was difficult." Day One of camp started with off-ice medical testing but continued with on-ice fitness testing in the morning and finally an off-campus two-mile run later in the day. Pucks were nowhere to be found. They won't be on the ice here until at least Sunday. Call it a scare tactic, but the goal of the program, which Tortorella has been running since he took over as coach in Tampa Bay 10 years ago, is to hold players accountable for how they train in the offseason and to make sure they come to camp in the best shape possible. "You pretty much have to or you'll look pretty silly out there," Richards said of showing up in top shape. "Everybody is doing this stuff in August so that way as a team everybody is in shape." It's true that players train in the summer months to prepare their legs, hearts and minds for Tortorella's fitness testing. But practicing the test in August and actually doing it for real on the first day of camp are two different anmals, forward Brandon Prust said. "I felt way better last year because I didn't know what to expect," Prust added. "Sometimes your nerves get the better of you. It's a tough test." Friday's on-ice program was designed to test the players in long sprints. The 60 players that skated (Artem Anisimov and Michael Sauer were held out and Marian Gaborik was not here) were broken up into four groups of 13 to 19 skaters. The six goalies were in the fourth group and, yes, they had to go through the same physical grind as the skaters. The players had to complete three full laps around the rink, touching all four circles, six times before they were done. They went in groups of four and they were being timed, though captain Ryan Callahan said that was just to make sure they didn't stop sprinting. Some, like rookie defenseman Tim Erixon, appeared to have no trouble at all -- he skated as effortlessly on his sixth tour around the ice as he did on his first. Others, such as second-year forward Derek Stepan, struggled as the laps wore on and the legs grew weary and got wobbly. "I'm definitely more comfortable with the atmosphere here and how everything is run, but that test doesn't get any easier," Stepan said. * All four groups of players had to do a full-out sprint for three laps around the rink, basically touching all four circles, six times -- a total of 18 sprinted laps. Four skaters go at one time, with two starting opposite each other on one blue line and the same for the other blue line. There are 13 to 19 players in each group. The six goalies are in the fourth group. Each group is timed, but captain Ryan Callahan said there is no specific time they have to hit -- they just have to sprint it. * All groups will have a two-mile run at a local track Friday afternoon. They must finish in less than 15 minutes. * There is a different set of on-ice fitness tests set for Saturday. As much as the captain might have wanted to make a good impression on his teammates, Callahan couldn't help but feel the burn, too. "No matter how much you prepare for it or how good shape you're in it's a hard test," he said. "No matter if you're in your second, third or fourth year, the test doesn't get easier. I think I was doubled over and panting, but everybody is. It's a hard test." But it's an important test. "That's a shift, it's a 40-second skate basically and as you go through these couple of days you can tell who has done their work," Tortorella said. "I made it known specific to the group that that lets you know what type situation you have with the hockey club, what you're looking to do to make this hockey team or to stay in a position with the hockey club. You can tell pretty quickly if the guys have done their work. And listen -- I can see in this camp already the guys have done their work." Friday's round of testing also served as a reminder to the Rangers that the significant buzz around the team is something for outsiders to concern themselves with. The Rangers added the top player available in free agency (Richards). They're heading to Europe for two weeks to open the season. They'll open the partially-renovated Madison Square Garden on Oct. 27. HBO cameras have already been in town to do some promotional shooting for what is reportedly, though not officially, going to be the Rangers' involvement in "24/7" and the 2012 NHL Winter Classic. That's all in the first three months of the season. "We're anxious to get going," forward Brandon Dubinsky said. "I'm excited that today is finally here and we're on our way." Not before going through another couple of rounds in Tortorella's proverbial torture chamber Saturday. "It's important to come in ready to go for the season," Dubinsky said. "This (testing) certainly scares or motivates guys to get their work done in the summer."